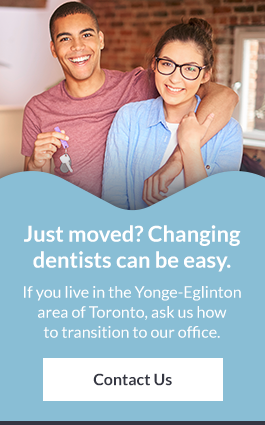 At Capitol Dentistry in North Toronto, we use dental implants to help patients fill in the gaps in their smile. If you require an extraction and a tooth replacement, we are here to provide you with the care you need. Are you missing a tooth and looking for a replacement? We always begin with a consultation to ensure the patient is indeed a candidate for dental implants. For example, a patient will need to have a sturdy jaw bone structure, healthy gums and good overall health. Once we've determined a patient's candidacy, we begin the actual placement of the dental implants. During the first appointment, the implant post is placed – the number of posts depends on the number of teeth a patient is having restored. Once the mouth has had time to heal and the bone has attached to the post, we place a permanent crown on each dental implant. The most obvious benefit is a strong, beautiful and healthy smile. What is not so obvious, however, is that dental implants don't adversely affect the teeth next to the implants. Dental implants don't slip like ill-fitting dentures and they have a high success rate. Some dental plans may cover tooth replacement options as part of your insurance. If you are unsure about what your plan covers, we recommend reaching out to your insurance provider for clarification. At Capitol Dentistry in Toronto, we offer tooth extractions services from wisdom teeth removal to PRF treatment. If you're at the Yonge-Eglinton area of Toronto and think you may need an extraction, come and see us. Our dentists offer extraction services to remove teeth when required. We have an on-site periodontist if complex extractions are required. Wisdom teeth may start to come through when you are an adult. You may require oral surgery if the extraction is complicated. Our dentists will meet with you to evaluate your smile and evaluate your need for extractions. Platelet rich fibrin is available at Capitol Dentistry for oral surgery or tooth extraction to heal faster and with your own tissues. Ask us about PRF treatment if you require oral surgery. Are extractions covered by dental insurance? Many dental plans cover extractions if they are necessary to maintain your oral health. If you are unsure about what your plan covers, we recommend reaching out to your insurance provider for clarification.